If you haven't known yet, you can also find nice shoes and clothes at SM Supermarket. During my last grocery shopping at the supermarket of SM Bacoor, I chanced upon two pairs of really nice yet very cheap shoes. Each pair costs only P299.75. It can't be any cheaper than that! At first glance, these jelly shoes look like real loafers. Shoe Box (the name of the brand) really got the design and style right. I love the bloody red color of this one. 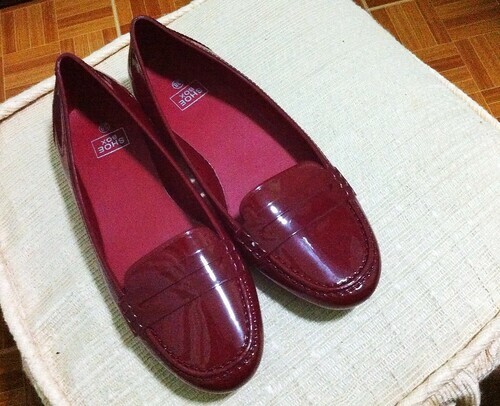 I didn't hesitate to buy this pair because it makes my feet look fairer and it's also perfect for rainy days like what we have here in Manila right now. Haha. I've always loved peep-toe shoes. 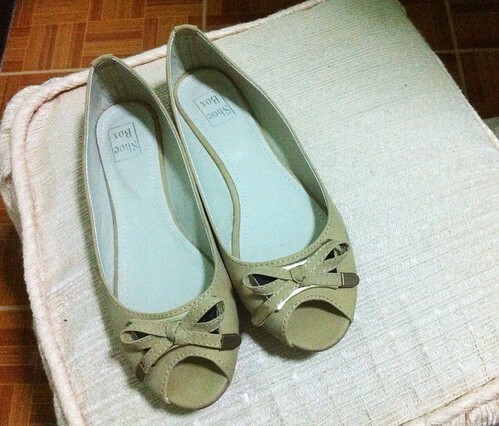 These peep-toe flats are so light and comfy. The ribbon detail with black shiny metal underneath is very chic. While fitting it I could already imagine myself wearing it to work. So nice.